You are here: Home > Should I Paint Aluminium Windows If They’re Difficult To Open? Should I Paint Aluminium Windows If They’re Difficult To Open? I have clients ask me if I think it’s worthwhile them restoring their old windows when they don’t open properly or if they’re the wrong colour or if parts are missing (such as window latches and sliding door handles). My answer always depends on the number of finished surfaces surrounding your windows that you don’t want damaged by ripping your windows out. The repair cost to surrounding surfaces can add tens of thousands of dollars to the replacement cost, making aluminium window restoration the best value solution. You see, often it’s not the condition of the window that determines whether windows are worth restoring, because we have restored some of the oldest looking, barely functioning windows you’d ever come across so that they looked and worked like new. If you’ve just finished renovating, then decided you don’t like the colour of windows, than the cost of replacement and repair to all the adjacent finished surfaces is going to make the replacement cost ridiculously expensive and the painting cost inexpensive in comparison. There are lots of reasons why you just wouldn’t want to replace windows if all you wanted was a colour change- such as the hassle of windows being trapped between double brick work, windows that have been plastered or tiled in, windows sandwiched between timber weather boards. And to remove all the risk of doing business with Window Revival we offer clients in writing the World’s only unconditional 7 year ‘no weasel clause’ money back guarantee against bubbling, peeling or flaking. 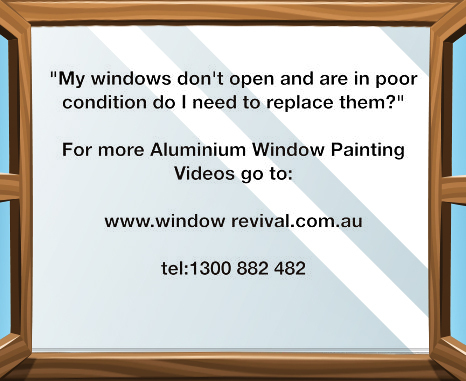 ← What If Aluminium Window Painting Finish Gets Scratched?